These are good. But…I had to try the recipe twice. The first time, I followed the directions exactly and I couldn’t get the mixture to heat past 200 degrees. Frustrated (but determined), I tried it again. This time, instead of heating it on low like the directions stated, I heated it on medium-high. I know, I’m such a rebel. But it worked. Combine all ingredients except vanilla in a small saucepan and turn the heat to low. Cook, stirring constantly, until the sugar dissolves, then cook, stirring only occassionally, until the mixture measures 245 degrees. Stir in the vanilla and pour into the prepared pan. When the mixture has cooled to room temperature, remove the block of caramel from the pan and use a sharp knife to cut it into small squares. Wrap each square in waxed paper or plastic wrap. These keep for weeks, but are best eaten fresh. Note: I used a pizza cutter instead of a knife to cut the squares. What do I have to do to be your friend and have you send me some of these? I am way beyond where Brilynn is, I am not just afraid of hot sugar. I am afraid of cooking. I had trouble with my caramels too but they turned out pretty good. I really hate working with a candy thermometer. Those look fantastic! My MIL makes homemade caramels all the time and she makes it looks so easy. I have yet to try them, but may….may give it a chance! I got that cookbook in the mail just TODAY. I’m so excited – esp. after seeing you and Smitten Kitchen make caramels (hers with salt). And now I get to go shopping, too, for a candy thermometer that actually works. Look at the size of those caramels! You are so generous–I would have made another 3 or 4 passes with the pizza wheel in each direction. Then again, my wife does the caramel wrapping and that is my least favorite part. Brian, I ended up cutting those pieces in thirds! Kudos to you for attempting caramels! I have attempted that feat myself and I graciously hand that task over to someone else! 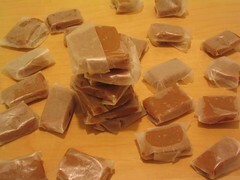 My nana makes the creamiest,yummiest caramels in the world.I will stick with hers! Great post! I make these to give as gifts at Christmas, although my recipe uses more cream and more syrup. They’re wonderful, but all that stirring grows tiresome after a while, doesn’t it? I usually don’t bother with the thermometer, and just go by the colour of the caramel and the ice water test, because I hate having to try to stir around the thermometer. (Silly, I know.) Anyway, yours look wonderful, and I got a chuckle from the fact that you ended up cutting those big pieces into thirds. Love the idea of using the pizza cutter! 245 degree…in ‘C or ‘F?